Set out clothes the night before. Even if you don’t actually pull the clothes out of your drawers or closet, make sure you know what you want to wear the next day and make sure everything you plan to wear is clean and dry. This goes for you, your significant other, and your kiddos. Nothing like rushing around in the morning trying to get everyone ready only to discover that your little one has no clean socks in his drawer. Empty bags and backpacks. Check for notes or things that need to be addressed. Even though our daycare had a spot by the door with weekly announcements and our kids’ classrooms sent home monthly newsletters, on more than one occasion, I forgot about special events that were coming up. Nothing like forgetting that you were supposed to bring a special snack for the classroom until you pulled into the parking lot to drop the kiddos off! So, make sure to empty the kids’ bags and backpacks each evening to look for reminders from school or daycare. Make sure bags and backpacks are packed the night before. After you empty the bags, you will have the perfect opportunity to pack them for the next day. Make sure any changes of clothes, sunscreen, or jackets are ready and in one place to make getting out the door easier in the morning. This is just for your sanity, mama. Take the extra 3 minutes the night before to prep the coffee pot. Even if your coffee pot doesn’t have a timer, having to push just one button when you stumble into the kitchen in the morning is so much more pleasant than having to measure out the coffee. If you have a Keurig, make sure the water is filled up. Make a plan for breakfast. It doesn’t matter whether you are stopping for food on the way to school or work, eating cereal, or actually preparing a breakfast meal for the family. Just know what the plan is. Knowing that the plan is for you to eat at home will help you get up a few minutes early to make sure you have enough time to make breakfast. On the flip side, knowing you are stopping for breakfast will help you get out the door early enough to have time to grab food en route. This is a big one. Use your lunch break wisely. Maybe you get your grocery shopping done on your break. Or maybe you go home and spend 20 minutes speed-cleaning your house. Maybe you use your lunch break to run to Target or Barnes and Noble for that one nagging item that you keep meaning to pick up. However you choose to use it, make sure you use it well. Some days that will mean eating at your desk and working through your lunch break so you can get out a few minutes early. Some days that will mean you use your lunch break to pick up milk, the dry cleaning, and drop off the library books so you don’t have to worry about any of those after work. You’ve got that time in your day that’s yours to use – use it well. One of the most stressful times of the day can be the period between coming home from work and getting dinner on the table. Taking 30 minutes to an hour each week to plan out the meals for the week will make your evenings so much more pleasant. You don’t have to commit to a specific meal each day, but if you have the ingredients for four or five different dinners already in your fridge and pantry, determining what’s for dinner is much easier. Start a load of laundry before you leave for work. Put the laundry in the dryer before you eat dinner. If you have the opportunity to come home during your lunch break, flip the laundry then and you’ll get an extra load done each day. The key is to leave the clothes in the washer for as little time as possible. No one likes funky clothes, but if your house is anything like mine, the laundry is always piling up and I need to get that extra load done each day. What about you? 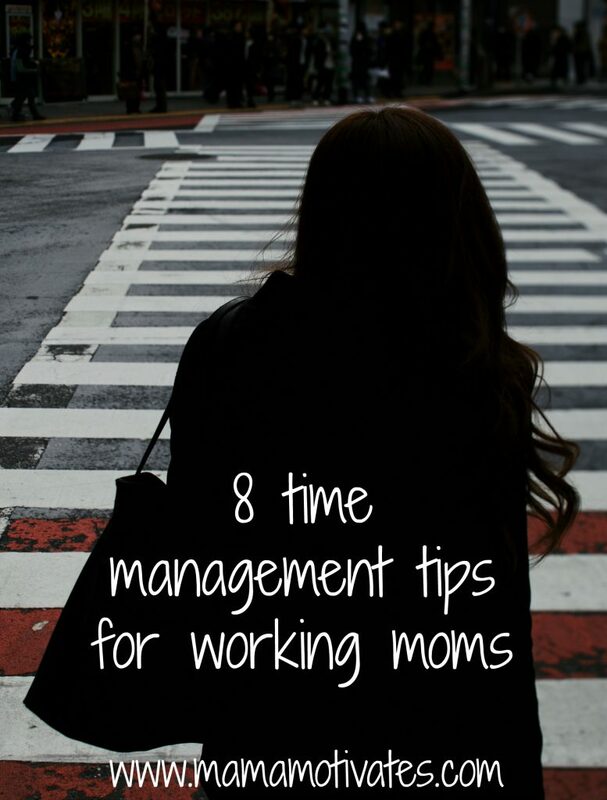 Do you have any time management tips for working moms? What is your favorite way to cross one more thing off your to-do list each day? I love these tips Suzanna! I’m working outside the home 3 days a week and I agree with all of them! One thing I do is when the papers are taken out of the bags – I write the important dates and reminders on our family calendar on the fridge. If it’s not on the calendar – I usually quickly forget about it! These are great tips, Suzanne! I do anything and everything I can on Sundays to make the whole week easier, including laying out all our clothes and prepping make-ahead snacks and breakfasts.